Stuff&Stuff is collaboration at its best. 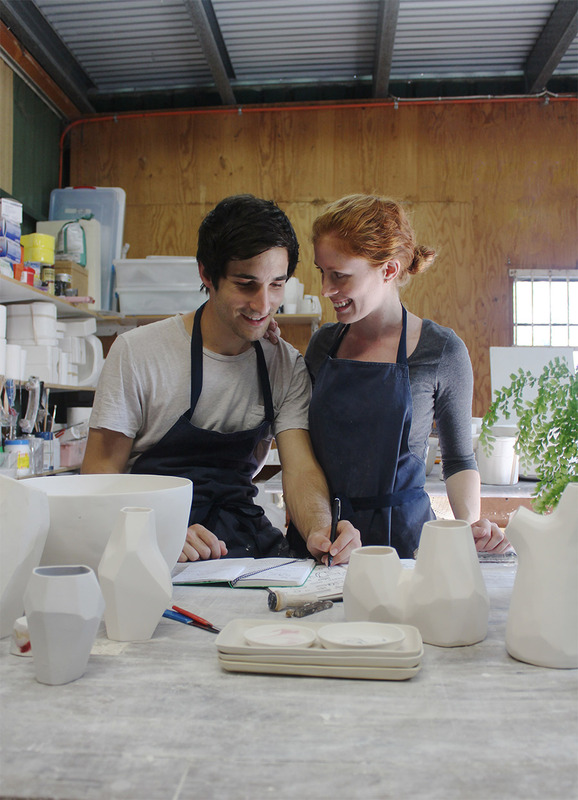 Melanie and Adrian, teachers and industrial designers, utilise each other’s strengths when designing and creating their ceramics. The results are playful and refined, you can really tell these two have fun when making together! 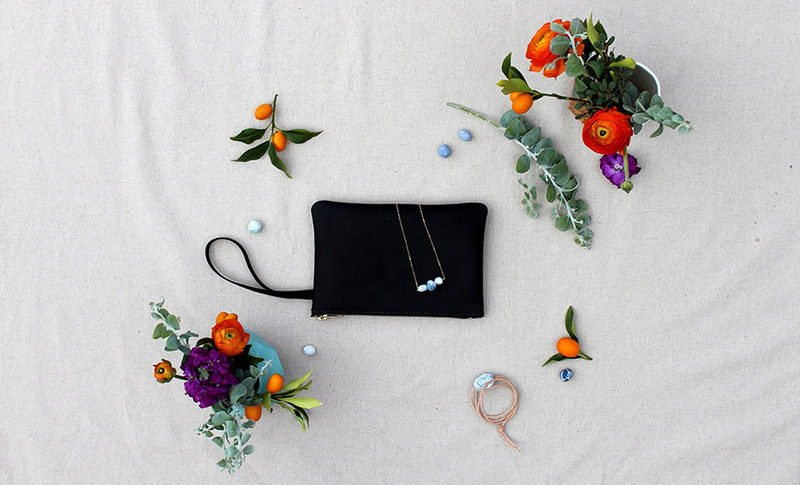 Read on to discover more, and be sure to pop by the Stuff&Stuff stall at our Sydney market next weekend! 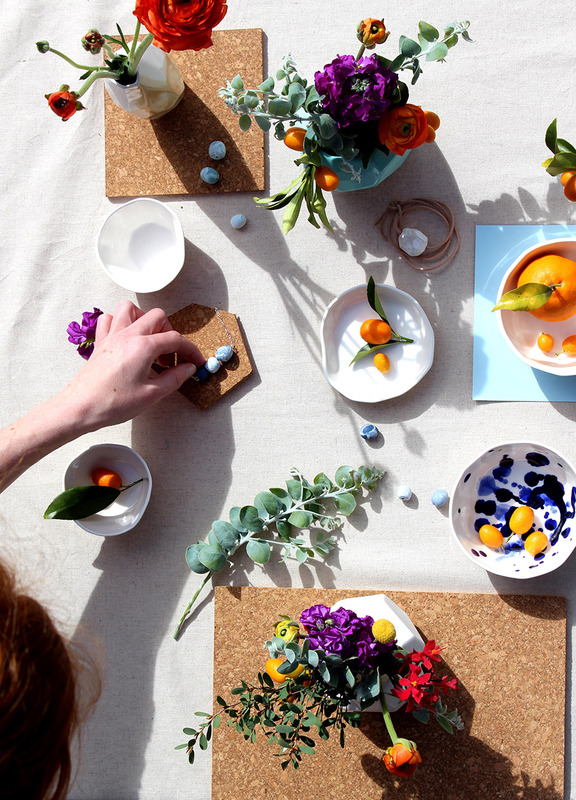 Stuff&Stuff is the design studio of Melanie Lockhart and Adrian Pjanic. We met while studying Industrial Design at the University of Technology, Sydney in 2008. During our final year of university we joked about starting our own design studio designing ‘stuff’ and from that came the name of our label. We put our design start-up plans on hold momentarily and both ended up going back to university and re-training as secondary school teachers. 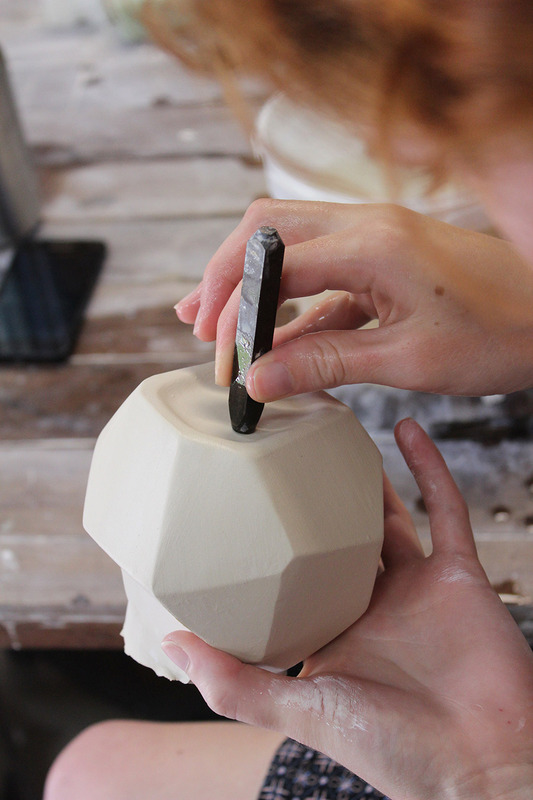 Now we work both as teachers and as designers, spending our spare time and weekends designing and making ceramic, leather and lighting products. We have done two markets so far and we’re still figuring things out ourselves. Displaying our work effectively is something that we are still working on (and it changes as our range does) and something that is very important for first time stall holders to consider. One piece of advice we can give, however, it to ensure you have a friend or someone else to help you out with your stall, even if only for part of the day! Seeing as there is always the two of us at our stall, we can’t even imagine doing it alone without another person to hold the fort for bathroom / food / shopping breaks. Tell us something exciting that you have planned for Stuff&Stuff for the next 12 months? As our training is in Industrial Design, our goal for the next twelve month is to spend more time designing and less time making. 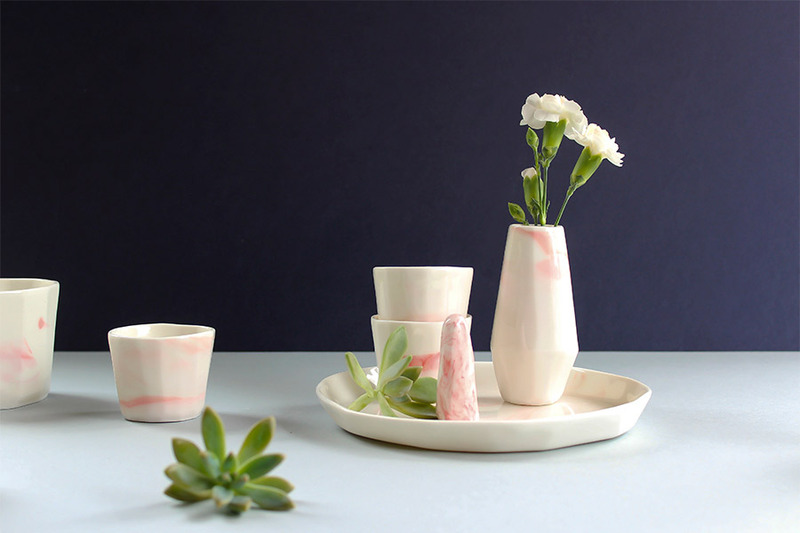 In the past couple of years we focused a lot of our time on making, especially as we were learning the magical and often temperamental ways of working with ceramics. Although we absolutely love using our hands, we crave the creative process that comes from sketching and prototyping new and original ideas, testing them and then turning them into a reality. Adrian’s sub-major was in Furniture Design and I studied Object and Accessory Design and Printed Textiles, so we would really like to start incorporating some different materials and products into our range. We have already started designing some statement lighting and ceramics pieces and would love to do the same with furniture or leather goods within the next twelve months. I think our best resource is each other. All of our designs come from bouncing ideas off one another. In our process, one of us might start modelling a design and the other will finish it and add their own spin. As an individual designer you have your own strengths and talents that make you unique. Having two people who have different styles, skills and strengths that work together makes for something even more unique. Together we have developed a completely different style and one that is always evolving. In a practical sense, we are always there to point out each other’s mistakes, and there is no way I would be able to pour 10L of slip into a 20kg plaster mould and empty it back out again by myself. 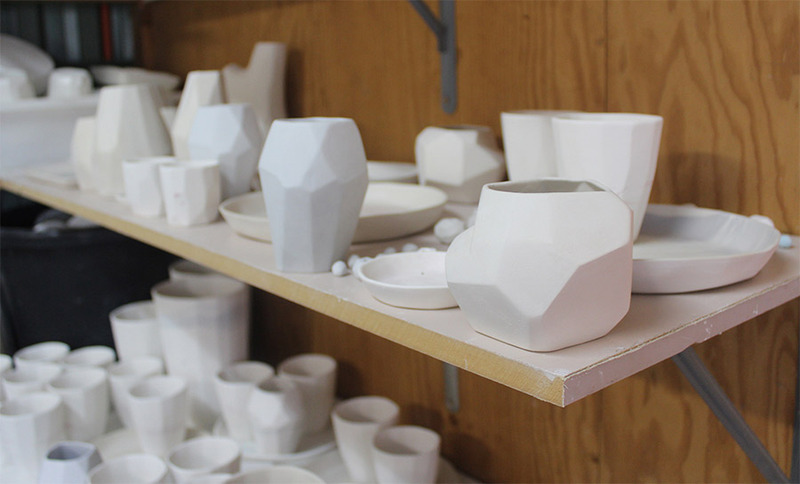 We love our unique and slightly wonky geometric pieces, especially the new vases we have designed which feature double (or triple!) openings. Their irregular shape gives them personality and their idea has come from the depths of our imagination and is made using the relationship between our heads and hands. We started sketching these ideas a couple of years ago and it has taken us until now to find the right mould-making techniques and the best ceramic slip to make them possible. 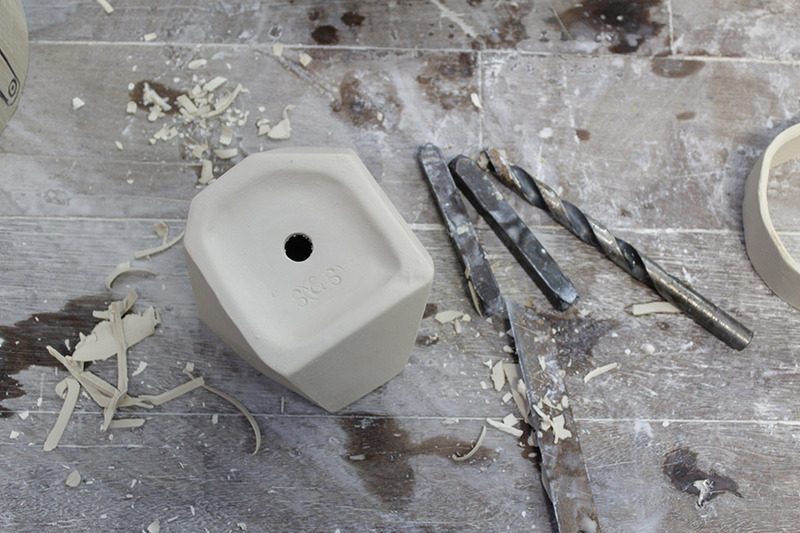 Each piece is carved from a chunk of plaster, using a series of sketches as a reference. It is then meticulously sanded and finished so that a clean mould can be made from it. 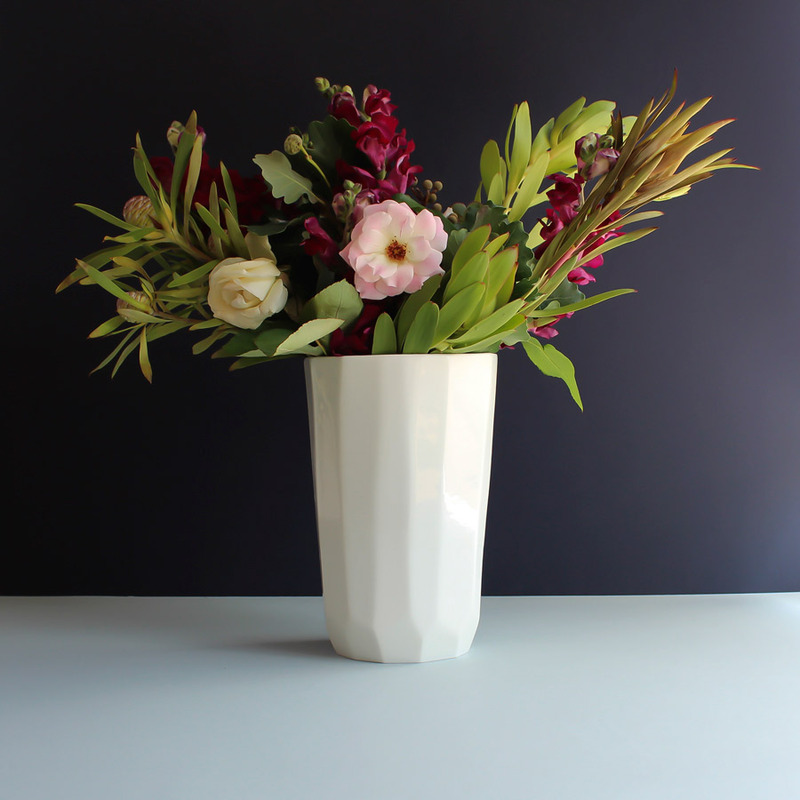 Some pieces, particularly the multiple opening vases, are still in the process of being produced but we hope to have some available at the next Finders Keepers Market!